When a brake job is performed, hydraulic parts may be replaced and brake lines may be opened. Either of these actions can cause air to enter the brake lines. Bleeding the brakes should be the final step of a brake job on a Suzuki Grand Vitara. 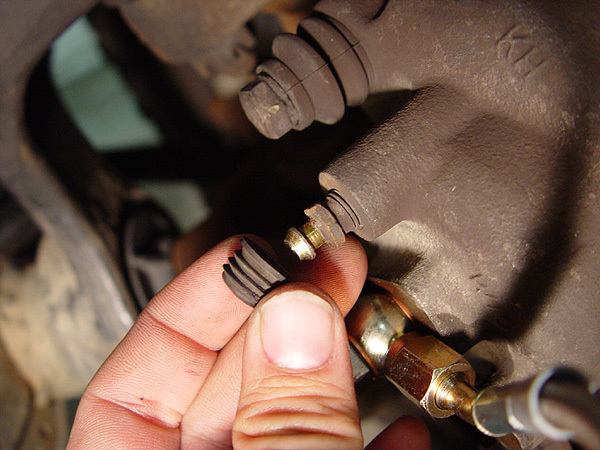 Bleeding removes air from brake lines and is a two-person job. Bleeding also removes and replaces old break fluid that may have been contaminated by moisture. Air and moisture contamination can cause the brakes to feel spongy or too soft. Ensure that engine switch is turned to the "Off" position. Pour brake fluid into the master cylinder reservoir. The master cylinder is a white, squared reservoir with a black cap, located in the area of the engine on the driver side, near the windshield. Ensure that the master cylinder reservoir remains at least half full during the bleeding process. Remove the bleeder plug cap (see resources), and immediately attach one end of the vinyl tube to the bleeder plug. Place the other end of the vinyl tube into the bucket. Ask a friend to sit in the car to depress the brake. Depress the brake several times in a row. Loosen the bleeder plug one-third to one-half turn with a wrench while the brake is depressed. This will cause brake fluid to squirt out into the tube and then into the bucket. Each time you are ready to turn the bleeder plug, ask your friend to depress the brake. Ensure that the brake fluid reservoir remains at least half full during this process to avoid air getting back into the brake line. Listen for air bubbles during the process. When you no longer hear bubbles, ask your friend to depress and hold the brake. Tighten the bleeder plug using a wrench. Re-attach the bleeder plug cap. Apply fluid pressure to the pipeline, by depressing the brake pedal, while checking for leakage. Fill the brake fluid reservoir with brake fluid to the specified level. Check the brakes for firmness. The brake pressure should not be too soft. Bleed air off the brake system when the fluid hydraulic circuit has been disconnected. There are two separate lines in the hydraulic lines of the brake system. One is for the front wheel brakes and the other is for the rear wheel brakes. Both left and right front wheel brakes should be bled along with the left rear wheel brake. Kay Matthews has been writing health-care-related content for a variety of websites since 2004. Her areas of expertise are HIPAA, medical billing, medical editing, nurse assisting, health-care law and medical transcription. She has written on a myriad of topics beyond these areas and attended numerous writing workshops. How do I Change the Clutch Fluid in a Honda CRV? Why does my car stall when shifted into gear? Why does a car stall when you brake?